Cast iron skillets are indispensable in the kitchens of home cooks and professional chefs alike. 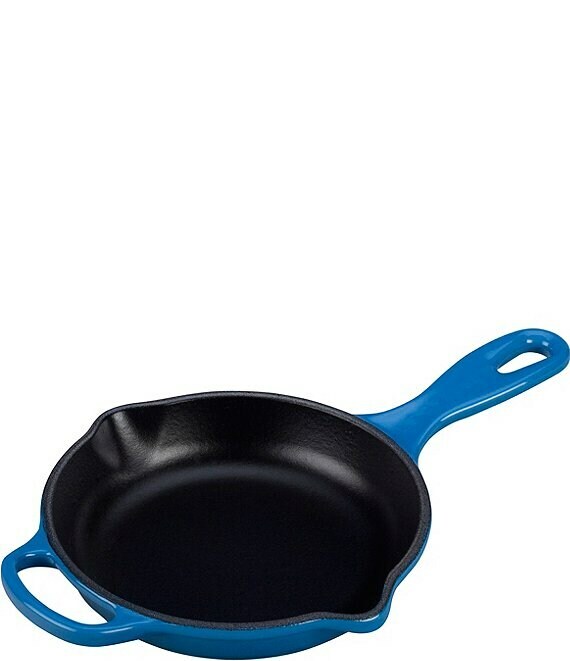 The interior surface of a Le Creuset skillet is finished with a matte black enamel that eliminates the need for the traditional seasoning and maintenance of raw cast iron. Specially formulated for high-surface temperature cooking, the enamel develops a natural patina over time that is ideal for searing, sauteing and frying. Le Creuset produced the first enameled cast iron cookware nearly a century ago, and the original foundry still operates today, where 15 skilled artisans hand-inspect each piece. This tradition of the finest culinary craftsmanship, combined with the latest innovations in comfort and functionality, make Le Creuset unsurpassed in both beauty and quality.